Up to now, Iceland has been overly dependent on foreign oil sources, so here comes its impetus for sustainability push, to reduce the 80% share of Iceland’s energy coming from non-fossil resources, led by hydropower and geothermal energy. "Being able to provide our own energy is very important to our independence," said Jón Björn Skúlason, Head of Icelandic New Energy, a company that coordinates national initiatives among government, industry and research institutions. While fossil fuels still account for 20 percent of overall energy usage, the Icelandic government has put in place a state-financed incentive program to increase the use of electric vehicles. It's already having an impact—today there are more than 6,000 e-cars, compared to a scant 90 in 2014. To power these e-cars, more than 20 ABB fast charging stations have been installed along Iceland's famous Route 1, the 1,300+ kilometer road that's the country's main highway and its logistical backbone. The ABB fast chargers can top up an e-car battery in just 15-30 minutes. All the ABB chargers support comprehensive solutions for user authorization, payment and network connectivity. 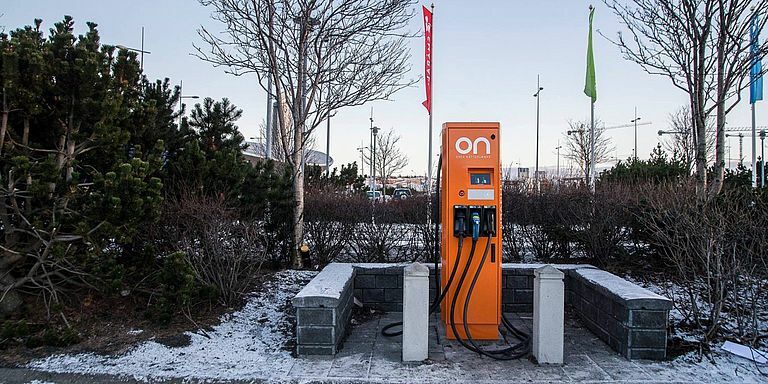 A stable charging infrastructure for electric vehicles is crucial if Iceland is to realize its ambition of becoming 100 percent energy sustainable. “In the beginning people were skeptical, but now they see e-vehicles on the road and realize that they are here to stay," Skúlason said. ABB Ability technology guarantees that the charges are operational 24/7. Remote digital connectivity enables continuous monitoring of the device from any location on the island. This gives ON Power access to data in real time for the remote monitoring and proactive control of the operational and technical status of the charging stations. ABB provides a fully flexible overview of the entire charging network to make sure the system is fully functional right down to temperatures of -35C. Cloud-based technology connects the chargers to the Microsoft Azure cloud-based platform to drive greater value and efficiency. This means that technicians can diagnose over 90 percent of all errors and solve over 60 percent of them remotely without having to go to the location, and at the same time, this makes it possible for ON Power to guide their customers in the best possible way. “ABB is typically able to remotely reboot a charger if there is an error, which is extremely convenient in Iceland, due to the long distances and tough weather involved in sending out service personnel,” said Óskar Gústavsson, sales manager at Johan Rönning, ABB’s distributor in Iceland. ON Power has enlisted its company color to help motorists locate the chargers. “All the chargers are orange, which makes them easier to see when the harsh weather reduces visibility,” said Lasse Altmann, Business Development Manager for ABB E-Mobility Charging. EV infrastructure networks and operators are confronted with significant initial investments in infrastructure while the short term revenue streams from charge sessions are variable. Additionally, this emerging and ever-changing market demands a continuous adaptation of business models and updated infrastructure software that provides new usability features to EV drivers. ABB Ability™ EV Charging solutions allow to connect thousands of chargers to a highly redundant cloud platform. 24/7 managed network operation centers monitor the connectivity between charger and the customer B2C platform. Advanced digital services include remote configuration, software updates, diagnostics and troubleshooting to maximize charger availability with a minimum of on-site visits. Charger Care with in-house resources or third party service providers perform advanced service work such as commissioning, remote diagnostics and repair.